As we roll into summer, it is time to get ready for potluck picnics! You know the ones: overcooked hamburgers being charred into prehistoric fossils as the randomly appointed grill master confidently presses every last ounce of juice out of the patty with a firm downward thrust from his spatula shaped scepter. Meanwhile, you gaze quizzically at the spread of desserts, marveling at the realization thirty different flavors of jello fluff exists, only to be interrupted by a cadre of children swarming in a frantic attempt to sample each one, carefully licking each finger as they go. 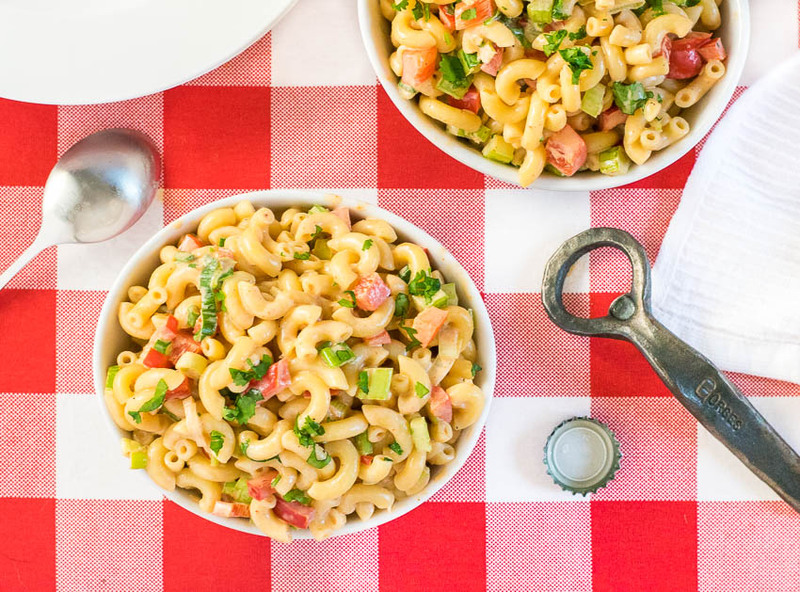 Well, at least your BBQ Pasta Salad will be edible. I have been on a bit of a BBQ kick lately. I purchased an amazing smoker a few weeks back, and I’m certainly making the most out of it! Smoked whole chicken with a blackened seasoning anyone? Seriously, if you don’t have a smoker, I highly recommend getting one. However, I decided I needed to expand my repertoire of BBQ side dishes, which is where this BBQ Pasta Salad comes in. 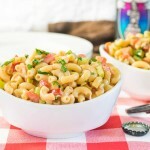 I made a few different version of this BBQ Pasta Salad, and the one I liked best was from Stubb’s BBQ website. When I find a recipe elsewhere I like to customize it to fit my preferences, however their BBQ Pasta salad was pretty much spot on as written. They obviously recommend using their own sauce, but any of your favorite BBQ sauces will work well for this recipe. The above Amazon links are affiliate links. Any Amazon purchases made through these links help support FoxValleyFoodie.com at no additional cost to you. 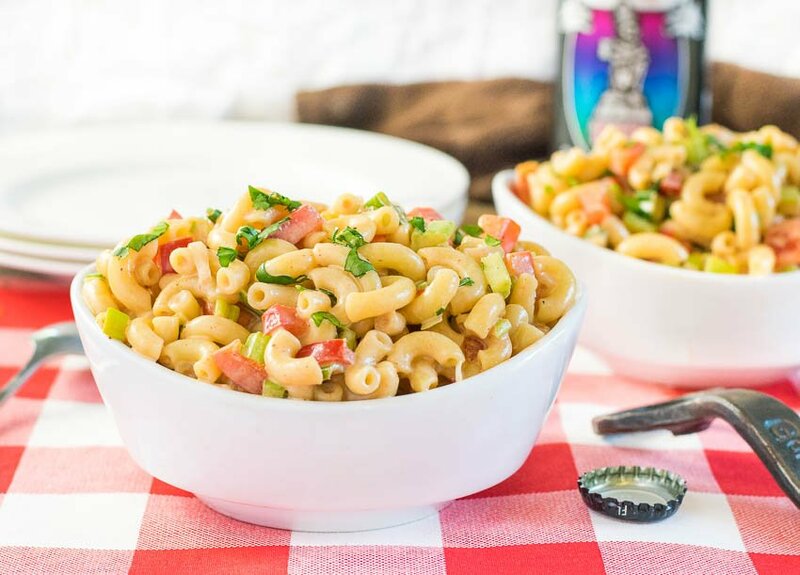 The deep smoky flavor of barbecue sauce ensures this creamy BBQ Pasta Salad will be a hit at your next picnic! Boil macaroni in a pot of salted water according to directions, then drain and rinse noodles under cold water to cool. While noodles are boiling combine mayo, BBQ sauce, vinegar and seasonings in a bowl and mix to combine. Add noodles and vegetables to the bowl and stir till sauce evenly coats everything. This can be served immediately or made in advance and stored in the refrigerator. If you enjoyed my BBQ Pasta Salad recipe then you should probably like me on Facebook and follow me on Pinterest too. That’s what I would do at least, because if you don’t get to know me but you still use my recipe it is kind of like taking candy from a stranger, and your mom taught you not to do that. Don’t disobey your mom, subscribe to Fox Valley Foodie today.